Shopping for techies? Athletes? Partiers? Cuddlers? There’s something for every person you know in this year’s Make Change holiday gift guides. The best part? You’ll be giving to your loved ones and to society. Every entry on the list either comes from an ethical company that gives back or is a sustainable, social-conscious item. Swiss Army knives are known for their multitude of useful tools, but this model, a partnership with Nespresso, adds a new feature into the mix—sustainability. Made from recycled aluminum Nespresso coffee pods, the knife includes a can opener, a bottle opener, a screwdriver, a blade (of course), and a few other gadgets. Whether they’re eating lunch atop a girder dangling over the New York City skyline, or putting away stacks of burgers at Pop's Chock'lit Shoppe, men sure love to eat sandwiches. Disposable plastic bags might keep your workplace meals dry and intact, but they also end up in landfills and oceans, contributing to our ever-growing plastic pollution problems. Reusable, washable sandwich bags can be used over and over again, keeping your precious sandwiches safe without tossing a bag into the garbage. Rudy’s has grown from a local Seattle barbershop and tattoo parlor to a national brand over the last 25 years. The products in the 1-2-3 bundle, which includes shampoo, conditioner, and bodywash, are unisex and feature simple, no-frills branding and packaging. The brand has long maintained a relationship with the It Gets Better Project, which aims to support young LGBTQ people, and every purchase of Rudy’s 1-2-3 package contributes to product donations to shelters for homeless LGBTQ youth. Kinkajou Bottle Cutting Kit by Bottle Cutting, Inc.
Photo by Bottle Cutting, Inc.
Men love beer, and men love projects, especially projects that somehow involve beer, or that can be done while drinking beer. 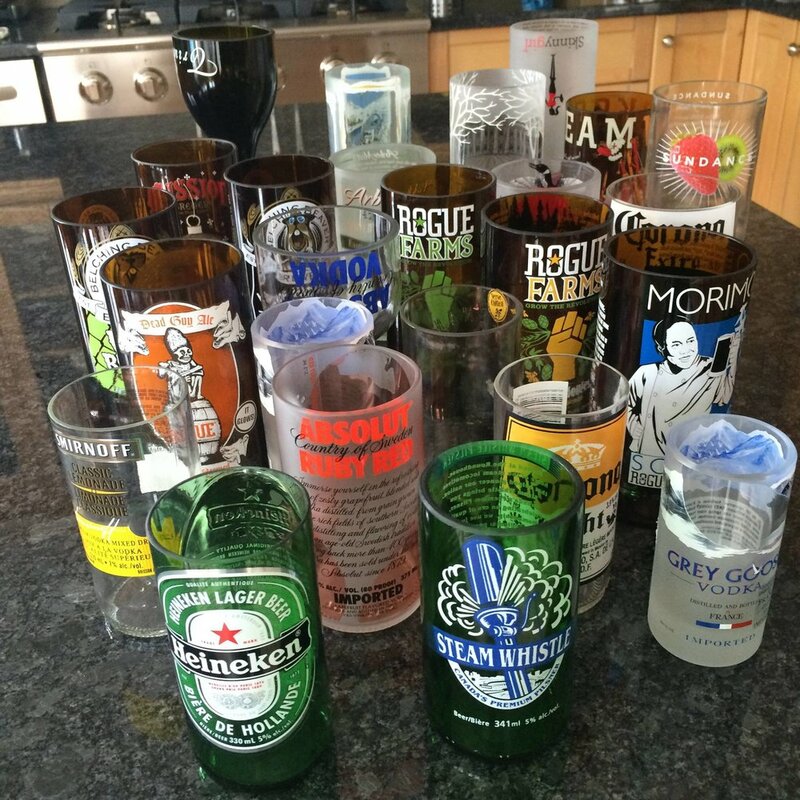 The Kinkajou bottle cutter, named for a fuzzy, tree-climbing rainforest critter, allows you to upcycle your empties into glasses—which can be used to facilitate additional beer drinking—as well as vases, candles, and other useful household receptacles. For the nature-loving poet in your life, or anyone who needs a little place to stash their thoughts away. The “leather” around this distinguished-looking notebook is made from teak leaves, and each small journal is handcrafted, giving it a distinct, unique pattern. For every purchase, Tree Tribe facilitates the planting of 10 trees. Is there a man in your life that’s dried out? Wrinkled? A withered husk of who he once was? You might try giving him the gift of water, a classic blend of hydrogen and oxygen with a proven track record of keeping humans both moist and not dead. For every purchase of a water filter system, Soma donates water to its partner nonprofit, Charity: Water. Conscious Step offers a variety of stylish footwear and combo packages, each of which supports different causes and nonprofits. There are socks that trigger donations to save sharks, fight hunger, and support important medical research and malaria net donations. (This set donates to deforestation, ocean, and enviromental causes.) With all the choices, odds are there’s a sock here that contributes to something he’ll care about. Elephants are awesome, literally, grand beasts of gasp-inducing size and weird, unknowable animal intelligence. But between poaching for illegal ivory and development-related habitat loss, elephants have dwindled in number, leading to grave concern over the future of these majestic-yet-goofy creatures. Did you know you can just, like...buy someone a tree? A local nursery or farm near you can tell you what trees are suitable to an area’s soils and climate, and what varieties will grow in your yard, or in a pot in your living room. “Sure, trees are pretty cool,” you might be thinking, “but do they come with any special features?” In fact, trees come with some of the most special features out there: There are trees that will grow with you for the rest of your life, trees that will build stout trunks and host families of birds, and trees that will produce shade, beauty, and fruit. Not only that, but studies have shown upping the plant factor in your life can actually make you happier and less stressed out. For the one you love: Timeless and elegant, this sterling silver ring is adjustable to any finger and comes with either a white or purple sapphire. Shiffon uses ethically sourced materials, designs in-house, and relies on New York artisans for creation. And here’s the best part: 50 percent of profits from the pinky rink go toward funding seed grants for female entrepreneurs and startups supporting female empowerment, so she can take pride knowing her accessory is making a difference. For the yogi: This 5mm mat, made from repurposed wetsuits, is perfect for all yoga and at-home workouts—even the super sweaty hot classes. Plus, SugaMat guarantees the C2G model for life. Anything happens to it and replacements are free. Photo by Hand in Hand. Looking for something minimal? Hand in Hand soaps are all-natural, lightly fragranced in awesome scents like Cactus Blossom, and with every purchase made, the company donates a bar of soap and a month of clean water to a community in need. If you’re looking for something a little fancier, try the Mayfair Soap Foundry. They smell great, come in decorative bottles, and with every product sold they make a donation to the Starlight Children's Foundation—a nonprofit that helps kids and families who are experiencing health challenges. For the one with wanderlust: This classic cotton and silk scarf is lightweight, versatile, and perfect for any season. The design is crafted through a centuries-old hand block-printing process using nontoxic and AZO-free dyes, so each one is unique. Bloom & Give donates 50 percent of their profits toward girl’s education programs working to provide infrastructure in public schools, fight gender inequality in education, or re-integrate drop-outs in marginalized areas. 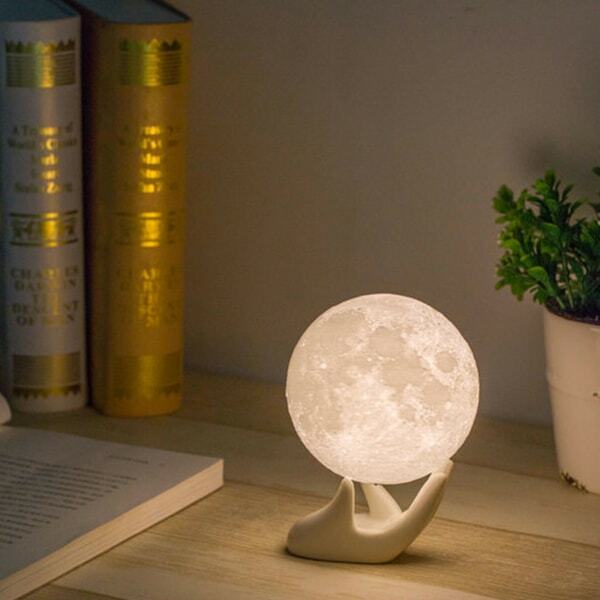 For the romantic: This photorealistic mini-moon is perfect for unwinding after a long day or meditating in the early morning. The LED light emits a soothing glow of soft white or yellow light, creating a relaxing and inspiring ambiance, anytime. Also, it’s 3D printed using eco-friendly materials, so you’ll feel good knowing your purchase isn’t hurting the environment. For the one who needs to chill out: This essential oil blend is as invigorating as coffee-- without the crash. The mixture consists of rosemary, peppermint, and ylang ylang and can be diffused, inhaled, or placed on the wrists and temples whenever you need a lift. Plus, Uma reinvests a third of their yearly profits into social initiatives within their local community—like funding a health clinic or providing academic scholarships. For the fashionista: TOMS are getting chicer and chicer every year. 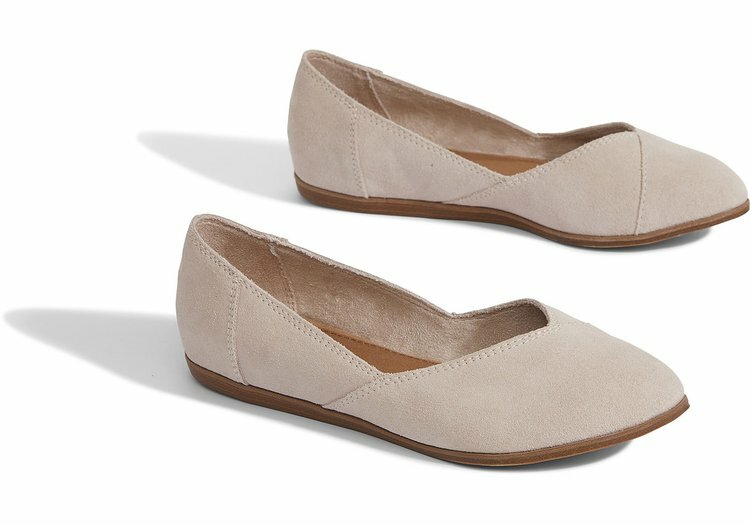 These comfy flats (available in blush pink and shade gray) will become her office go-to and she can feel good knowing your purchase gave back with TOMS’ one-for-one business model. That means as you buy this gift for that special someone, you’re buying a gift for someone in need, too. For the insomniac: This eco-friendly, pure silk eye mask offers comfort and pure darkness for your most restful sleep. The dyes used are low impact, AZO free, and mixed with treated and recycled water, so you don’t have to worry about putting anything gross on your face. Plus, you can sleep easy knowing the Ethical Silk Company donates 5 percent of profits to the Jeevan Jyothi AIDS Center and 5 percent to Focus Ireland—a nonprofit working to prevent homelessness. This sustainable tea contains anti-oxidants and stress-reducing properties reported to do everything from reduce heart attacks to ease an upset stomach. Talk about the gift that keeps giving! Plus, David’s Tea is certified fair trade and plastic liner-free, making this purchase good for the body and the environment. And what’s tea without honey? Catskills Provisions has a line of raw wildflower honey that’s all-natural, handmade, and never heated — so all of those delicious antioxidants and amino acids aren’t lost in processing. It’s sweet and sustainable. For the boho babe: Perfect for bedtime, lounging around the house, or those days when you just want to be cozy, these chic lounge pants are handmade in India by women at the highest risk of human trafficking. By gifting Punjammies, you’re contributing to providing these women a living wage and a life of freedom. For the workaholic: Made from glass seed and soft paper beads, this necklace was created to celebrate focus and persistence. Plus, BeadforLife invests profits from sales into entrepreneurial training programs for women in poverty so they can open small businesses, increase their incomes, and support their families. This wreath is made entirely from grown garlic, organic thyme and rosemary, and dried red chili peppers. Every wreath is handwoven and made to order in the U.S. After the holidays, your in-laws won’t need to throw this wreath in the trash—the herbs can be stored and used for months. Garnish any gift with a sweet treat, like the Cacao Prieto Organic Criollo Chocolate Bar. It’s organic, kosher, made in Brooklyn, and manufactured using sustainable methods on a family farm in the Dominican Republic. Considering how chocolate’s getting a bad rep among sustainability experts, purchasing one that doesn’t hurt the environment (and tastes amazing) will make your stocking that much more special. Photo by Under the Canopy. Bathrobes are an in-law staple, but these up the gift-giving game. Under-the-Canopy uses cruelty-free, ethically sourced organic cotton and OEKO-TEX certified, environmentally friendly dyes. Plus, their workers receive fair wages and ethical treatment. These rustic wood baskets are handcrafted out of discarded Chinese fir tree root balls. Available in two sizes, each basket is unique, with different variations in the wood, cracking, and undulations. They’re also food-safe, meaning your in-laws can store everything from crochet yarn to apples without worry. Alter Eco chocolates and confections are made from farmer-owned co-ops growing sustainable cacao. This gift box includes a wide range of everything they offer—from bars to truffles to clusters—so you don’t have to guess what your in-laws might actually eat. And for every box sold, they’ll plant a tree in the ACOPAGRO Cooperative in Peru. Photo by Land of a Thousand Hills. Land of a Thousand Hills Coffee consistently ranks in the top 5 percent of specialty coffees, and each bag is roasted to order. This affordable monthly or biweekly subscription includes a rotation of the company’s favorite brews. Purchases also help support the nonprofit side of Land of a Thousand Hills, which funds initiatives to build health facilities, support single mother households, and provide clean water. Every candle at Prosperity Candle is hand-poured by a “woman artisan building a brighter future for herself.” The candles, which use high-quality environmentally friendly soy and essential oils, smell great, and last around 20 hours. The company also sells gorgeous gift boxes. Our favorite, the Pioneer Valley Gift Box, was handcrafted by women refugees in Easthampton, Massachusetts. The set includes a range of culinary goods and their signature Tobacco Barn candle. Photo by Women’s Bean Project. Colorado-based Women’s Bean Project hires chronically unemployed women. Over the course of a six- to nine-month program, women receive a steady paycheck, support services, and job training. According to the company, 93 percent of the program’s graduates are still employed a year later. Beyond all things beans, the project also makes spice and baking mixes. One Hope partners with a host of nonprofits, from animal rescues to medical charities, and portion of every purchase goes toward those charitable efforts. This year, you can add a little holiday cheer of the liquid variety: this set includes a mini Christmas tree, complete with lights, ornaments, and topper. You can also pick the wine—and we won’t tell if you pick up another couple of bottles to get yourself through the holidays. Photo by Noah’s Ark International Exports. 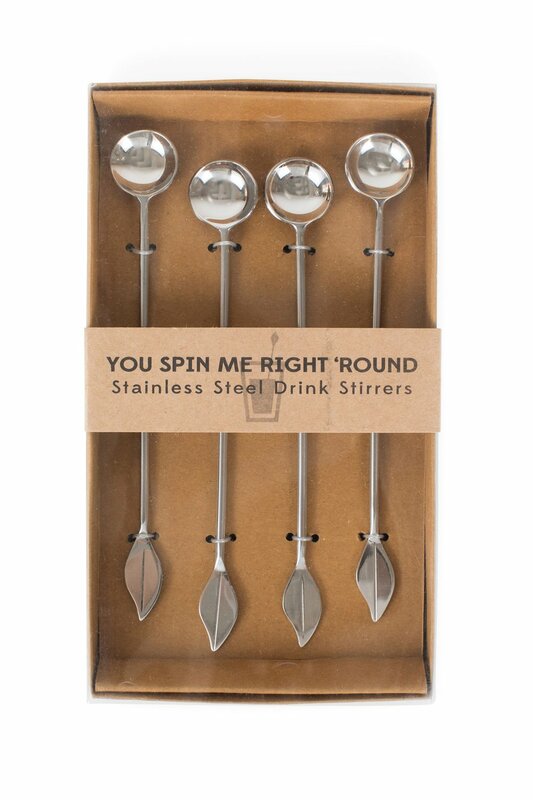 This set of mother-in-law-friendly stainless steel stirrers were handcrafted in Moradabad, India, through Noah’s Ark International Exports, which employs largely women artisans working out of their homes. Since 1986, Noah’s Ark has helped 20 artisan workshops become independent through their collaboration.